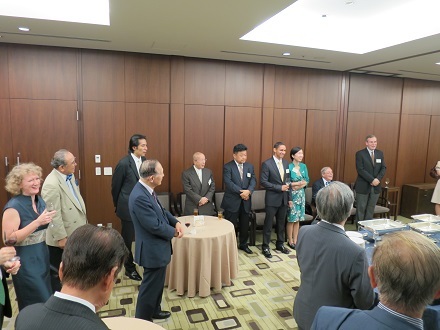 On Wednesday 25th September we were very kindly invited to the exclusive Mitsubishi Club in Marunouchi. The Mitsubishi Club was founded by the 28 members of the Friday Club – the 28 core members of the Mitsubishi Group – in April 1973 to commemorate the centenary of the foundation of the Mitsubishi Group. These 28 Friday Club companies are all famous Japanese industrial companies, including Mitsubishi Corporation, Mitsubishi Tokyo UFJ Banking Group, Nikon and Asahi Glass, to name but a few. The Mitsubishi Club can only be used by the Board Members of these 28 core Mitsubishi Group Companies for celebrations and other occasions, and by no-one else (almost), except the Cambridge Oxford Society by very kind invitation and gracious arrangements of C&O member Buhei Okumura (Trinity Cambridge). 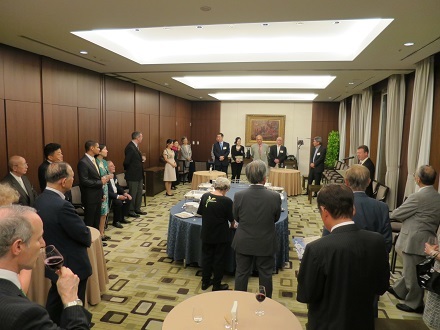 The Mitsubishi Club is at the top of Mitsubishi Corporation’s headquarters and commands fantastic views over Marunouchi and the Imperial Palace Gardens. Feeling honored by this exquisite location, we had good turnout, and we welcomed several new members: Gregory Hadley (Kellogg Oxford), Dong Gyoon (Hans) Hyun (St John’s Cambridge), James Nepaulsingh (Keble Oxford) and returnee Yasui Hayashi (Christ Church Oxford). Posted in Event Reports | Guests welcome Submitted by huw.williams on Wed, 2013-09-25 09:00.